November 5, Dubai, UAE: Emirates Central Cooling Systems Corporation (Empower) concluded a series of top-level meetings as part of the United Nations Environment Programme (UNEP) initiative on ‘District Energy in Cities’, the company said through a Press communiqué. The event was held in India from November 1 to 3, 2017. 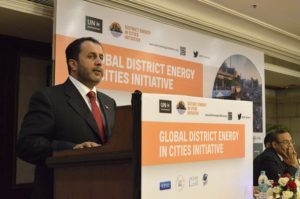 According to the communiqué, Ahmad Bin Shafar, CEO of Empower and Special Advisor to UNEP on District Cooling, participated in the meetings with representatives of the Indian Government and industry experts and showcased the implementation of District Cooling services in Dubai and its sustainable benefits. He also discussed how such projects could be implemented in Indian cities. The UNEP ‘District Energy in Cities’ initiative aims to scale energy efficiency worldwide, including the role of District Cooling services to ensure more efficient energy and water consumption. District Cooling is one of six energy efficiency accelerators under the United Nation’s ‘Sustainable Energy for All’ initiative.